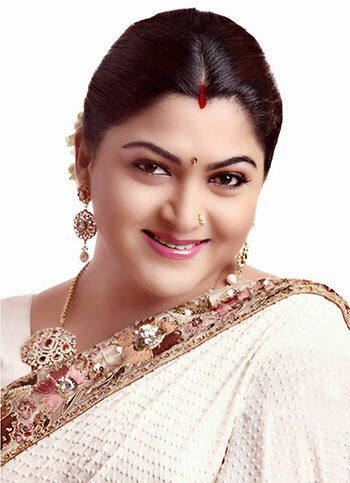 Khushbu is an Indian actress, producer and television presenter who has worked in over 200 films across various film industries of India. She is predominantly known for her work in Tamil cinema, in addition to Malayalam, Kannada and Telugu films. She is the recipient of several accolades, including five Tamil Nadu State Film Awards for Best Actress and one Kerala State Film Award – Special Mention. Born Nakhat Khan on September 29, 1970 in Mumbai, Maharashtra, India, to Najma Khan, she has one brother named Abdullah. She started her career as a child artist, appearing in the 1980 film “The Burning Train” in the song “Teri Hai Zameen Tera Aasman”. In 2010, she ventured into politics by joining the DMK political party. She is married to actor/director/producer Sundar C. They have two daughters named Ananditha and Avanthika. *She was born in Mumbai, Maharashtra, India on September 19, 1970. *She began her career as a child artist. *She won the Tamil Nadu State Film Award for Best Actress twice (in 1991 and 1995). *She is known for her television show Jackpot and her serials Kalki, Janani and Kungumam. *She became the first ever Indian actress for whom her fans built a dedicated temple.